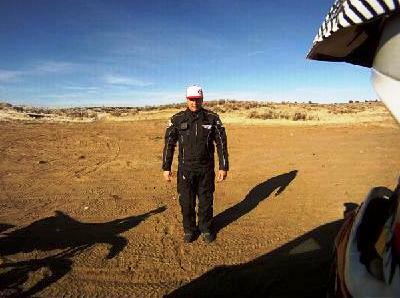 In terms of high quality outerwear for adventure dirt biking it's a KLIM/MSR/Fly Racing world as far as we are concerned. KLIM probably has the most consistent high quality in their catalog but FLY and especially MSR have some choice bits that are worth consideration as well. The MSR Attak Pant is one such item. Our friends at Pocatello Power Sports recommended that we check out MSR's X-Scape and Attak Pant for riding in colder weather. We chose the slightly less expensive Attak because it had all the features we needed for a very reasonable price. The Attak Pant is built of rugged nylon and Cordura® that is windproof and waterproof throughout. There are two large mesh-lined zippered vents on the front, two large cargo pockets with stout Velcro closures, a substantial leather panel on the right leg, adjustable cuffs and the usual MSR waist closure/adjustment system. All seams are sealed with waterproof tape. The inner lining is very fine mesh that appears to be quite durable and is definitely very comfortable. We've already logged over 100 miles in our Attak's in less than a week and are very pleased with them. They are quite comfortable to wear all day and are very warm, even in sub-freezing temperatures for as long as you care to keep going. Though we can't yet comment knowledgeably on the exactly how waterproof these are, we are completely prepared to swear by the fact that they are absolutely windproof. Worn over a pair of Under Armour® tights, our experience confirms that the Attak's are warm and toasty down to at least 200F. They move well, crash well and are blissfully devoid of useless appurtenances. They also survived their first washing admirably. Nits? Just a few. MSR needs to rethink their boot cuff system. In our opinion they should bin the strap and allow the cuff to open fully when unzipped. The waist closure and fit system similarly lacks much useful adjustability. 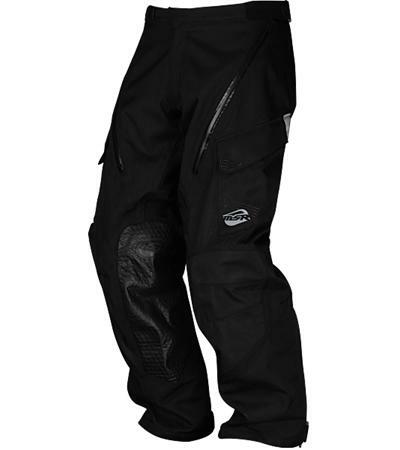 Othewise the Attak Pant works very well and is a great value for the money. We suggest ordering Attak's at least one full size large. NOTE: After several months of use our Attak Pants have begun to show signs of unusually early wear. Many seams have sprung and the liner has begun to deteroriate. We intend to contact MSR about this and we'll keep you posted on what they say. The Good: Warm enough for any winter riding outside of the Arctic (when paired with a thin inner layer). The Rad: Snazzy, rugged, waterproof and windproof for a very reasonable price. The Gnarly: Clothes pins work as well as the waist closure. See our cold and snowy demo ride.